Food safety is at the forefront of consumers’ food concerns. The food recalls issued in recent years, along with pressure from consumer groups and constituents, caused Congress to take up legislation to ensure the safety of America’s food supply. On January 4, 2011, President Obama signed into law the Food and Drug Administration (FDA) Food Safety Modernization Act (FSMA). The Act amends the Federal Food, Drug, and Cosmetic Act with respect to safety of the food supply and is aimed at helping the U.S. Food and Drug Administration (FDA) prevent food safety problems by shifting the focus from response to contamination prevention. This amendment is the most significant reform to food safety law in 70 years. In addition to giving FDA new enforcement authorities and new tools for managing imported foods, the Act requires food facilities to identify potential food safety hazards, and to develop and implement preventive control plans. It also requires FDA to establish fruit and vegetable harvesting standards. Over the course of 2013, FDA released multiple proposed rules that were open for public comment. “The Produce Safety Rule” establishes science-based standards for growing, harvesting, packing, and holding of fresh produce on farms. “The Preventative Controls for Human Food Rule” requires that food processors implement controls that prevent the contamination of food with human pathogens. Subsequently, FDA released proposed rules that addressed preventative controls for animal food, the safety of imported foods, and accreditation of third parties to conduct inspections on FDA’s behalf. This group of proposed rules reaffirms FDA’s preventative approach to food safety established by FSMA. OTA has focused its attention on these three proposed rules. FDA acknowledges that adjustment to new regulations will be a burden on food producers, and they propose various exemptions from oversight based on the size of operation and whether sales are made directly to the end consumer. The proposed rules also outlined a phased in approach that requires larger operations to come into compliance with the regulations first and additional time to adjust for smaller operations. 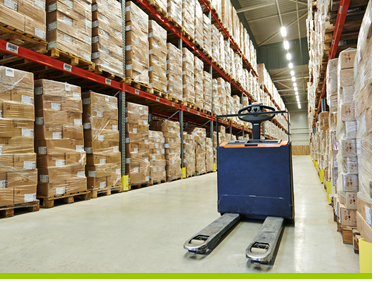 The FDA released final rules implementing the Food Safety Modernization Act. Of particular interest to the organic sector is FDA's Produce Safety Rule. The final rules clearly indicate that FDA listened to the feedback from organic producers and handlers and responded to the unique requirements of the organic system. 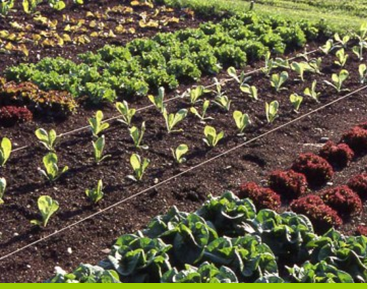 OTA is pleased that FDA’s final Produce Safety Rule is consistent with the supplemental rule in eliminating the waiting time for properly produced compost and deferring the proposed 9-month minimum interval requirement for untreated manure. OTA is also pleased that it commits FDA to conducting research into determining an appropriate science-based application interval. 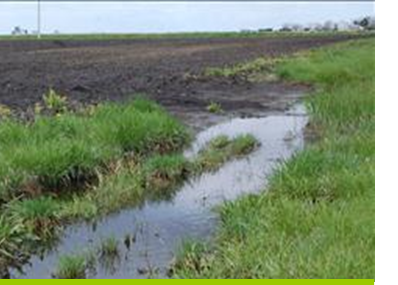 While this research is being conducted, organic operations will continue to follow the established National Organic Program (NOP) regulations for application of raw manure, with 90- or 120-day application intervals. FDA said in its announcement that adherence to the organic regulations is a “prudent step” to minimizing the likelihood of contamination. There is important new research underway in this key area. 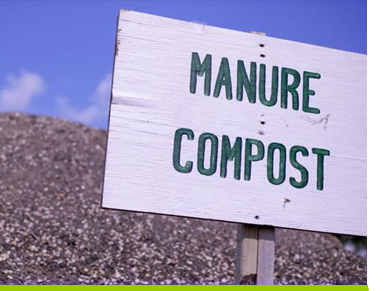 A $50,000 grant was recently awarded by the U.S. Department of Agriculture (USDA) to study the use of animal-based manure and compost in organic agricultural practices to best prevent the risk of soil pathogens. This grant was conceived and written in collaboration with The Organic Center and will greatly enhance efforts to improve production and handling regulations that impact food safety. The final water quality standard adopts the general approach in the supplemental rule and continues to reflect a more realistic risk-based approach, and has less potential to impose economic hardship on organic farmers, while supporting the safest food supply in the world. The final regulation supports a collaborative approach to local and regional agriculture, and reduces unwarranted burdens for operations that pack and distribute produce on their own farms as well as produce from neighboring farms. OTA welcomes FDA’s language that explicitly states that carrying out the new regulations will not require farmers to exclude animals from outdoor growing areas, destroy animal habitat or clear borders around growing or drainage areas. Organic farmers across the nation had expressed concern that the language in FDA’s initially proposed rules could conflict with the organic farmer’s requirement to maintain and improve the natural resources and biodiversity of their farms. Again, OTA commends FDA for listening to organic stakeholders and keeping in mind their unique needs. 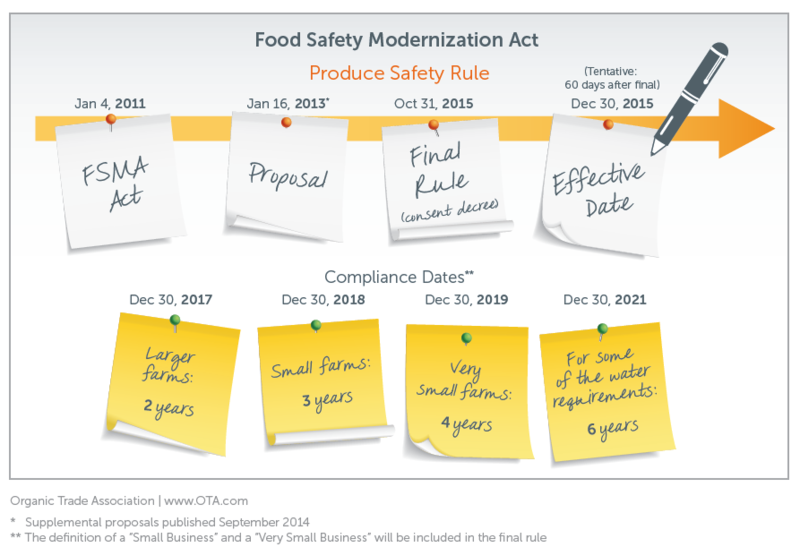 OTA and its Food Safety Task Force have worked to raise awareness on FSMA and the rulemaking process and develop comments to FDA proposing solutions that align with organic regulations without a reduction in food safety. Our focus was to ensure that FDA meets its mandate by releasing FSMA rules that are science-based and risk-based and do not duplicate or conflict with the organic regulations. OTA will continue to provide members with resources to help in the compliance process. The Produce Safety Rule would require farms that grow, harvest, pack or hold fruits and vegetables to establish and follow science-based standards for the safe growing, harvesting, packing, and holding of produce in its raw or natural (unprocessed) state. FDA proposes to set standards associated with identified routes of microbial contamination of produce, including: (1) agricultural water; (2) biological soil amendments of animal origin; (3) health and hygiene; (4) animals in the growing area; and (5) equipment, tools and buildings. The proposed produce rule provides growers flexibility in their approach to on-farm food safety, so that food safety practices being taken by farmers can be appropriate for the scale of production and type of agricultural practices being used. The Preventive Controls for Human Food Rule would require food companies—whether they manufacture, process, pack or store food—to put in place better controls to minimize and reduce the risk of contamination. The rule proposes each covered facility to prepare and implement a written food safety plan to identify potential hazards, similar to Hazard Analysis and Critical Control Points (HACCP) systems that are required by FDA for juice and seafood. If you are a manufacturer of organic animal feed or pet food, the U.S. Food and Drug Administration’s (FDA’s) proposed food safety rule will likely impact you. The deadline for submitting comments to FDA on proposed rules implementing the animal feed and pet food provisions of the Food Safety Modernization Act (FSMA) was March 31. Under the proposed Preventive Controls for Food for Animal Rule, facilities that manufacture, process, pack or hold animal feed and pet food would be required to develop and implement a formal plan for identifying and preventing foodborne illness, as well as establishing plans for correcting problems. The rule would require facilities to follow current good manufacturing practices that protect against contamination.